Topocad is a CAD system. But its proximity to GIS makes it ideal to use it along with other GIS systems, but also to use a lot of GIS work. Topocad format contains three different worlds of information. Co-ordinate files with point number and point code. CAD files symbols, line types, colours and layers. GIS data with its attributes. The combination makes it a perfect tool to combine these worlds. Databases linked up quickly and easily to and from Topocad. Three different types of adapters creates various combinations of data access, Database adapter FDO, Database adapter for ArcGIS and Database adapter ISM. Height calculations from terrain and/or point cloud. Topocads’ powerful managing of drawing and map sheets makes it easy to create different types of map products, building maps, cadastral maps and site plans. Also, Topocad has a large number of computing functions such as transformations, communication features, intelligent code tables and a full CAD library of tools for efficient data management. Along with the flexibility to work with GIS and databases estimate Topocad as a very clever tool for managing geographic data. 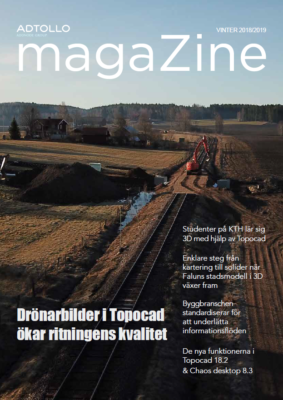 Want to learn more about Topocad and GIS (Geographic Information System)?